There was no power outage for Kevin Harvick at Gateway International Raceway on Saturday afternoon as he ran away from the field to win the Gateway 200 Camping World Truck Series. 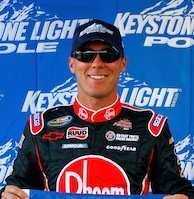 Harvick was starting for just the fourth time in the series this season but the victory was his third. He has finished in the top five of all four starts. He started from the pole at Gateway and led 143 laps. Harvick took the lead for good on lap 91 of the 160-lap race. He had a 6-plus second lead when a caution came out with 36 laps to go. On the restart, he again pulled away from the field and won by over 5 seconds. Finishing second was Brad Keselowski while Johnny Sauter was third. Todd Bodine, the series points leader, was fourth. Defending champion Ron Hornaday Jr. had trouble – again – Saturday when he broke a track bar and had to pit repeatedly after the mid-point of the race. He fell nine laps off the pace. The race was originally scheduled to be run on Friday night, but a power outage caused by a downed power line outside the track forced it to be postponed until Saturday. Austin Dillon, who won last weekend at Iowa Speedway, finished seventh.